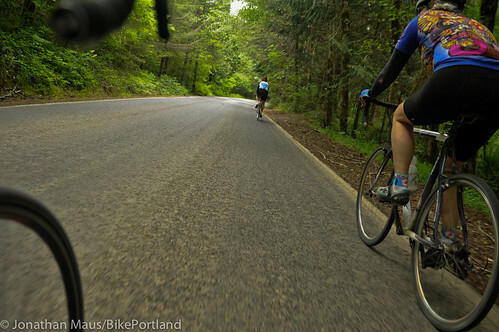 I cherished the chance to ride Burn Road. 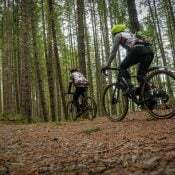 This is part of my coverage from a recent stay at the Coastal Mountain Sport Haus, an inn and lodge located in Vernonia that caters to bicycle riding guests. 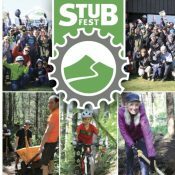 After riding the Beaver Falls Loop for the first time on Saturday, I was already smitten with the riding possibilities in Columbia County. 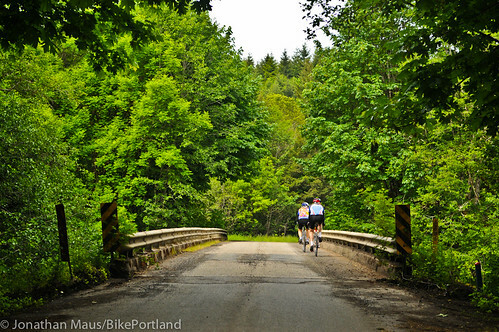 Then the next day, my hosts at the Coastal Mountain Sport Haus — Glen and Sandy Crinklaw — led me on another one of their favorite rides: The Burn Road Loop. Map via RideWithGPS. See full route details here. 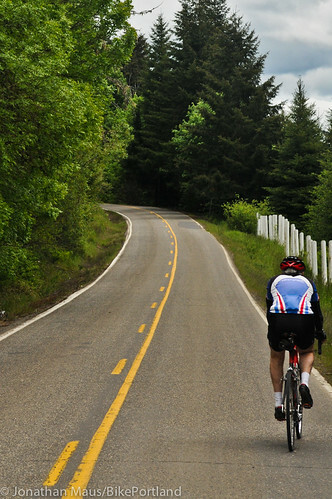 There are several attributes of a route that will get me instantly excited. 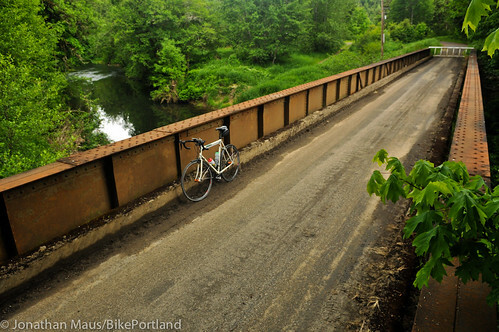 Riding empty gravel/dirt roads in new areas always ramps up my anticipation, and the Burn Road route promised a special added element that made me even more eager to hop on my saddle. 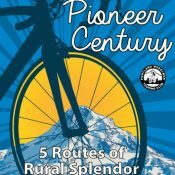 According to Glen and Sandy, Burn Road has been around since pioneer days. 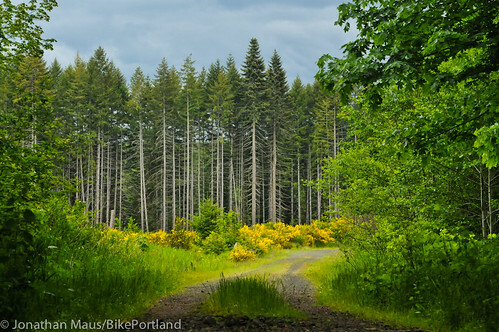 Back when the area was nothing but logging camps and homesteads, Burn was the main connection between the burgs Mist, Keasey and the larger destinations of Vernonia and Forest Grove. 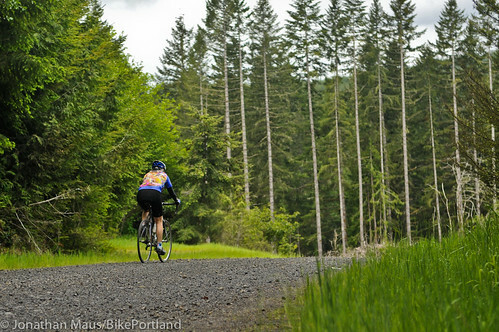 A chance to ride through Oregon history? Heck yes. 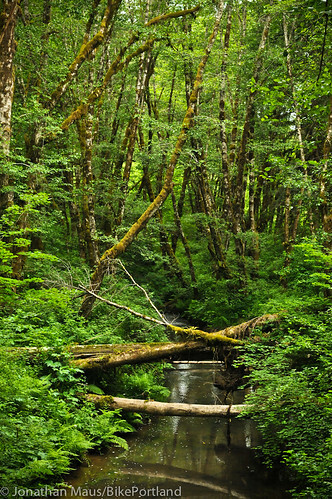 The Columbia County Commission was all set to sign off on the Weyerhaeuser deal. 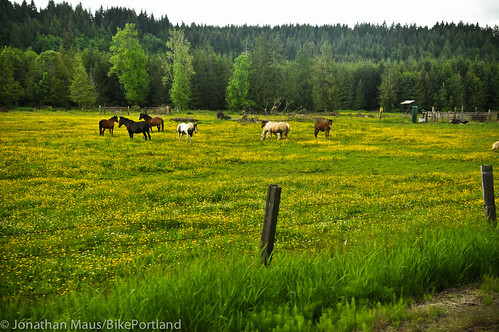 But then, “Locals in Mist and Keasey, and the older generation came out of the woodwork to oppose it,” Glen shared. “They said, ‘This is our heritage. '” Glen added that the “surprising level of passion” for the road ultimately led the Commission to turn down the deal. Sandy Crinklaw joined us on Sunday. 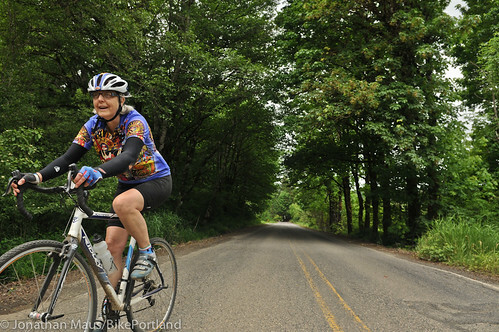 She grew up in this area and as we rode she shared stories about how her family used to picnic along these roads when she was a young girl. 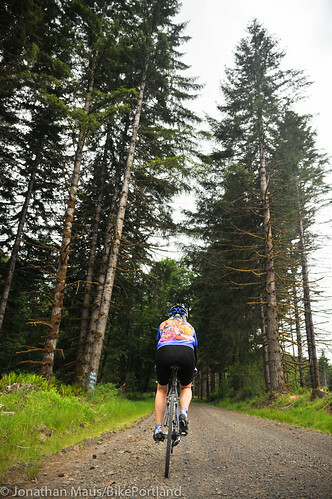 Sandy and Glen Crinklaw ride by the Natal School. Established in 1909, and just down the road from the Sport Haus, it’s where Sandy’s grandma once attended classes. 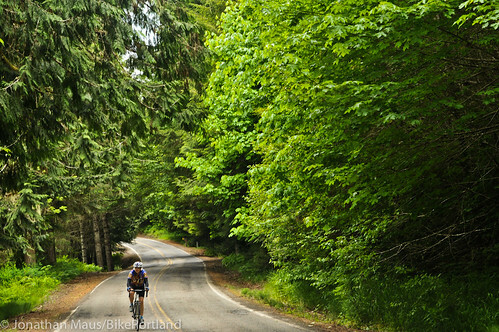 The road is as lush and green as you can imagine this time of year and it’s criss-crossed by stream and creeks. 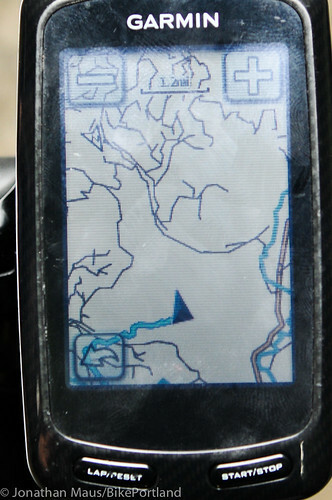 my GPS device had no idea where we were. 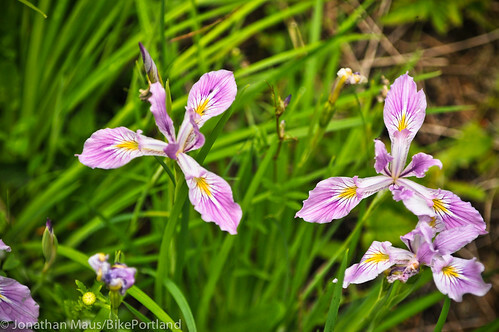 Native wild irises are in bloom. 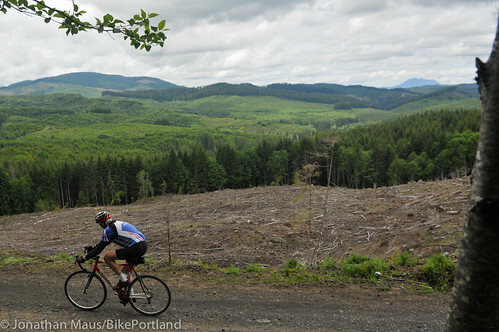 There are some good climbs on Burn Road, but the views are worth it (see below). The view of Saddle Mountain (which overlooks Seaside toward the west). 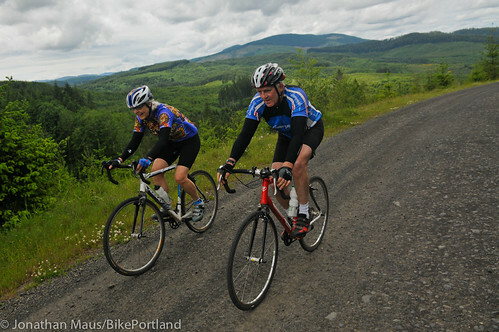 Sandy and Glen riding strong in their big backyard. 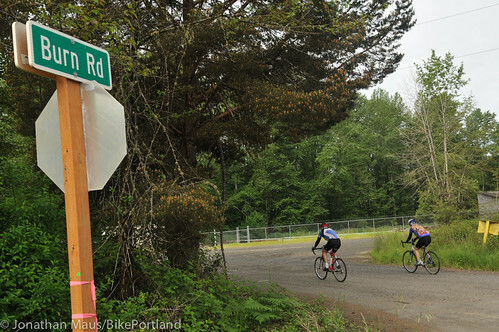 Burn Road ends at Keasey Road, where you make a left and head into downtown Vernonia. 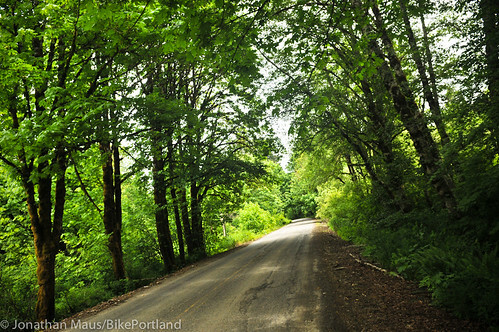 Keasey Rd is amazing. 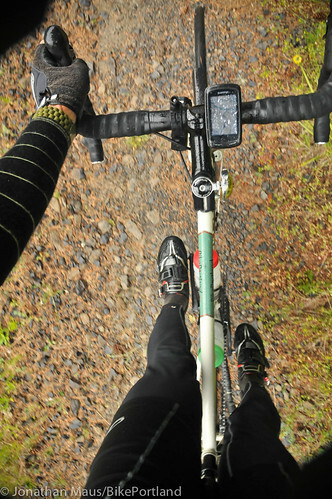 Covered by a tree canopy, quiet, empty and windy — near perfection for cycling. 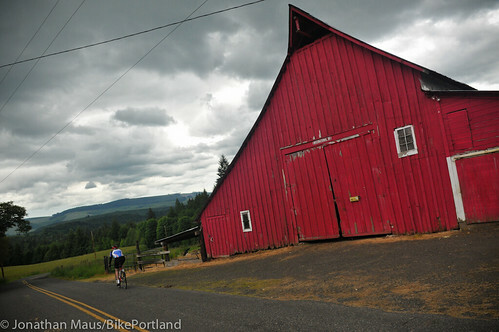 It’s even dotted with old barns and if you keep your eyes peeled you’ll even see the beautiful (and fully intact) Keasey homestead. 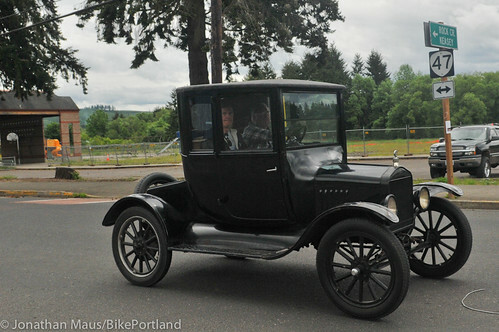 Since history was on my mind, it was serendipitous to come out onto Highway 47 in Vernonia and have this antique car rumble past us. 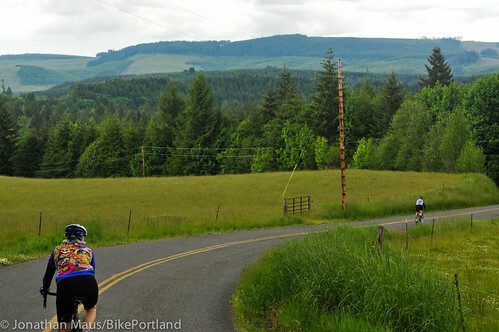 After a stop at the market in Vernonia, we continued east on our loop back to the Sport Haus. But instead of taking Highway 47, we hopped onto Stoney Point Road. 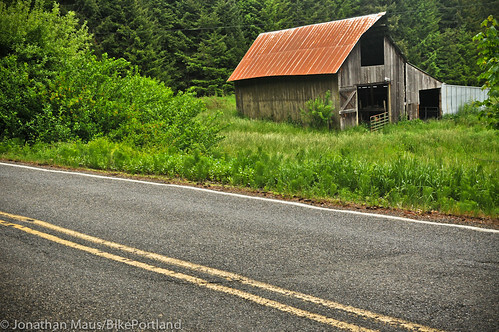 It’s an awesome option that cuts off about four miles of highway riding and takes you through fantastic old farm country. 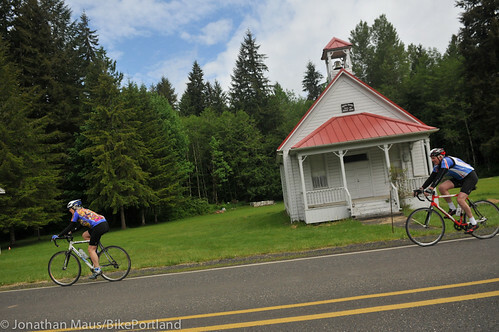 After Stoney Point, we rode Highway 47 for about two miles before I split with Glen and Sandy to continue on some gravel roads back to the Sport Haus (they opted for the flatter highway). 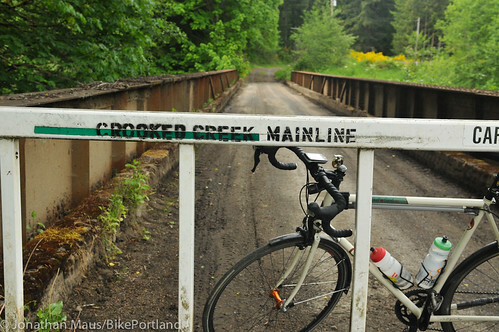 With their guidance, I hopped onto Crooked Creek Mainline, which you hop onto right before the “Pitt Stop” in Pittsburg (“mainline” refers to the main arterial roads used by logging trucks). 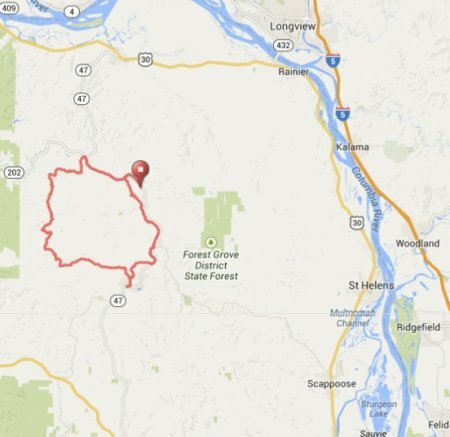 Once on Crooked Creek ML, I followed it along the Nehalem River then turned right onto O Black Mainline which took me back to Nehalem Highway just a few miles west of the Sport Haus. Not a bad place to change a flat! 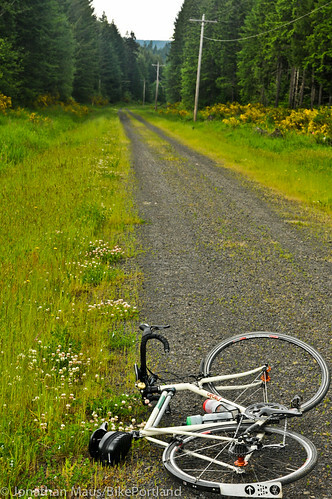 My promise: Riding out here will give you happy feet. I highly recommend this loop! 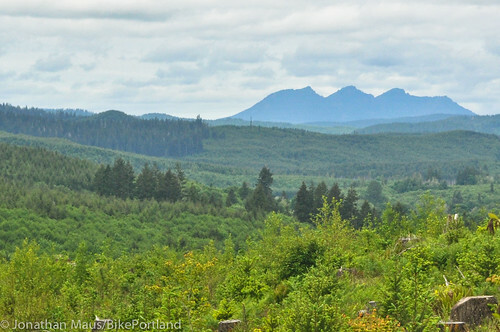 And if you’re looking for a great base camp to do this and all the other excellent riding in the area, consider staying at Glen and Sandy’s Coastal Mountain Sport Haus. 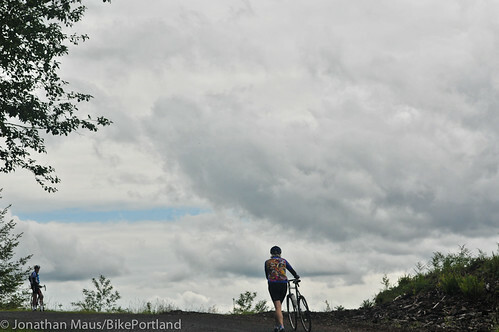 And check out our archives for more photos and coverage of riding in Columbia County. Thank you for this recent coverage. Can’t wait to get out there. 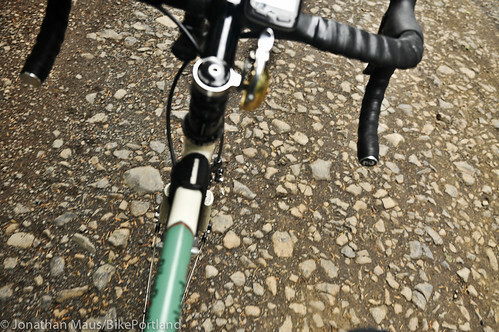 How wide/knobby of a tire were ya’ll riding with? 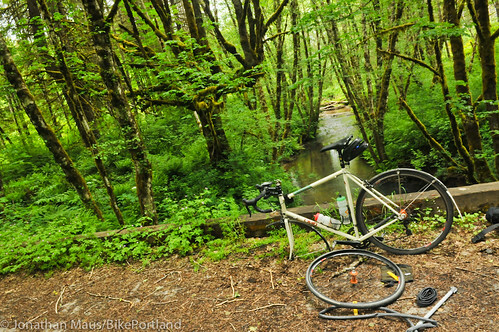 Also, it looks like if you don’t stay at that inn, Big Eddy Park is probably a good place to start.